Professor Haim Mendelson addresses the evolution of business models while considering the huge impact of the advances in information technology. Taking a long-term view, he sees information technologies continuing to evolve along their current performance trajectory. He argues that the combined effect of mobile technologies, wearable devices and sensors, cloud computing, and “Big Data” technologies will refine the structure of future business models. To this end he envisions scenarios such as: Customer intimacy agents being customers’ digital representatives in the marketplace, using data to find and solicit solutions that will make them better off. Value chain coordinators matching supply and demand, assembling customized solutions and engaging in electronic customer-data-driven innovation. Producers increasingly engaging in marketplace selling and data-driven innovations. At the same he believes that traditional forms of innovation will continue to remain key differentiators, and that underlying business models will require continuous innovation which will likely take a traditional form, with breakthrough products still continuing to require traditional forms of innovation. I. What is a Business Model? Business models are stylized models that describe how companies create and deliver value to their customers, and how they get rewarded for doing that. The business model construct encompasses the product or service, the customer and market, the company’s role within the value chain, and the economic engine that enables it to meet its profitability and growth objectives. Business models are often used by startups as modeling tools to help them design, prototype and build their new ventures. They are also used by established companies to plan, develop and support their innovation process. In this chapter, I use the business model construct to predict how companies’ architectures and business model development processes will evolve into the future. Who are the venture’s customers and what is its product or service offering? How does the offering create differentiated value for these customers? What are the venture’s go-to-market strategies? What is the value chain for the offering, and what parts of the value chain does the venture participate in? What are the venture’s sources of revenue? What is the venture’s cost structure? What are its key drivers of profitability? How will the venture meet its profit and growth objectives? The first step in business model construction or analysis is the specification of a value-creation model. This involves first identifying the target customers and the offering that will create differentiated value for them. Differentiation is important: to attract customers and make a profit, the offering has to be better than the competition on a dimension that makes a substantive difference to customers. The dimensions of differentiation vary across companies. For example, Walmart creates differentiated value for cost-sensitive consumers by selling a large variety of products at low prices. Apple creates differentiated value for consumers who are willing to pay for well-designed, “cool,” innovative products. USAA provides financial services to US military personnel and their families at superior quality by targeting their specific needs: for example, it accepts check deposits from soldiers’ smartphone cameras,2 and it heavily discounts customers’ auto insurance premiums when they are deployed overseas. Having a product or service that truly solves a significant problem for a well-defined customer segment is a good start, but it’s not enough. Any business needs to have effective go-to-market strategies that focus on getting the product or service to market, acquiring customers, securing revenue and market traction, and growing the market. A go-to-market strategy specifies how the business will bring customers in and how it will ultimately deliver to them the value it creates. Finally, value creation takes place along an end-to-end value chain. However, companies have to choose which parts of the value chain they will actually participate in. For example, a company that develops new technology may choose to license its technology to an established player without being involved in either production or distribution. Or, the company may manufacture the product in-house and sell it as a component to a better-known company that embeds it in its own branded product. Another alternative is to manufacture and market the product under the company’s own brand name. As we proceed from the first option to the third, the company covers an increasing portion of the value chain for the final product. The profit model of a business starts with an identification of its revenue streams and the associated costs. Since revenue = price × quantity and price is a key dimension of the value created for customers, it links the value-creation model to the company’s profit model. The most common revenue models are transactional: customers pay a fixed price per unit of the product or service, for example, $3 for a dozen eggs at the supermarket or $3 per gallon of gasoline. Transactional revenues may also incorporate fixed fees and quantity discounts. A different type of revenue model is a subscription model under which customers pay a fixed fee per unit of time, and they receive in return a fixed number of units of the product or service (e.g, one copy of a newspaper each weekday) or unlimited use over the subscription period (e.g., monthly membership at the gym). Another revenue model, commonly used for intellectual property, is the licensing model whereby the customers pay a royalty or license fee which allows them to use, sell or copy the product within a given period of time (unlimited in time if the license is perpetual), subject to limits on the scope of use based on geography, nature of use, etc. For example, software is mostly sold using a perpetual license, and the owner of a patent may license its technology to other companies in return for a license fee. Businesses often receive multiple revenue streams, where different customers pay according to different formulas or revenue models, or hybrid revenue streams, where a given customer’s payments combine different revenue models. For example, in the eBay marketplace, sellers pay a subscription fee if they “rent” an eBay online store, a fee per listing, and a fee for each transaction which is consummated on the platform.3 These fees vary based on the nature of the listing or transaction, the product category, and the pricing format, but their averages can be estimated. We can thus write the periodic revenue as the sum of subscription revenue, listing revenue, and transaction revenue, where each of these in turn has different drivers. The cost structure specifies the activities that drive the different costs of the business and how fixed and variable costs add up to total cost. For example, in a manufacturing operation, materials costs are proportional to the volume of units produced, whereas delivery costs may depend on both shipping distance and volume. Variable costs may be proportional to volume, or they may exhibit economies of scale—for example, purchased materials with a quantity discount. In some cases, they exhibit diseconomies of scale, for example, when an operation approaches its capacity limit, or when key resources are so scarce that their marginal costs are increasing. Each of these scenarios gives rise to a different cost structure. The logic of the business explains how the business will meet its profit and growth targets. It comprises an argument showing why the business will be successful, that is, how it will attract customers, be competitive and profitable, and grow. This often takes the form of a “virtuous cycle” which shows how the basic elements of the business model reinforce one another. There are a few recurring business model archetypes, each characterized by its own logic. I outline below the logic of three archetypes: one based on customer intimacy, where the business tailors solutions to customer demand at the front end; one based on operational excellence, which is based on superior back-end processes; and one based on value chain coordination, which creates value by coordinating front- and back-end elements of the value chain. I chose these three business model archetypes as I believe each will play an important role in structuring the company of the future. Our first business model archetype uses customer information to tailor solutions that satisfy unique, or highly-targeted, customer needs. This logic is often called customer intimacy.4 The logic of customer intimacy is based on a continuous learning relationship with customers, which means that the business has to initiate explicit or implicit dialogues with them, capture information about their behaviors and preferences, and use that information to customize products or services to these preferences. Customer intimacy has been practiced for literally thousands of years, but as I argue below, developments in IT will make it one of the central building blocks of the company of the future. To achieve its mission, the company focuses on customer loyalty via customization which relies on extensive data gathering and capitalizes on both employee attitudes and IT capabilities. Information is gathered and recorded during each customer interaction and service request. The information is systematically entered into a database which is accessible to all Ritz-Carlton hotels worldwide. Using the database, hotel staff strive to anticipate on a daily basis the needs of each guest and initiate steps that ensure a customized, high-quality service experience. Returning guests give Ritz-Carlton increasingly refined information about their preferences and needs, which enables the company to provide them with a superior experience. Because of this experience, guests are loyal to Ritz-Carlton and tend to book a Ritz-Carlton hotel whenever possible. This in turn gives Ritz-Carlton information that enables its staff to serve guests better than the competition, creating a virtuous cycle: information enables a superior experience, resulting in customer loyalty which generates yet better information. A different logic governs operationally excellent business models, which strive to minimize the delivered cost of the products or services they offer to customers by creating superior back-end processes. Having a lower cost base, they can have a price advantage over competitors. Alternatively, operationally excellent businesses may price their products or services competitively while reducing the intangible costs borne by their customers as the product and service is delivered to them. Thus, operational excellence is not about price alone—consider, for example, FedEx, which attempts to differentiate its offering on timeliness and reliability (“when it absolutely, positively, has to be there overnight”—the company’s tagline during its formative 1978-1983 years). Profitability in retailing is driven by the return on inventory investment, given by the product of inventory turnover (how many times a year the retailer turns over its inventory) by the markup over the cost of goods. A small, independent merchant may mark up its products by 100% and have two inventory turns a year, leading to a return of 200% on his inventory investment. A department store that reduces its markup to say 66.7% can achieve the same return on inventory investment by turning its inventory three times a year, attracting customers through lower pricing and greater product selection and innovation. 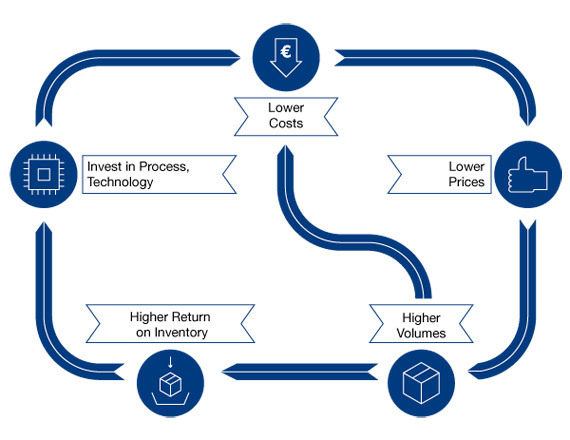 Walmart’s superior back-end processes and lower cost structure allow the company to increase inventory turns to reach the same or greater profitability than full-price retailers in spite of its lower markup. A markup of 50% and an inventory turnover of four would be sufficient to match the return on inventory investment of the department store and the independent merchant in the above example, and doing better would make Walmart more profitable (by 2014, Walmart increased its inventory turnover to 8 with a 32% markup). Walmart achieves lower markups coupled with high availability and low inventory levels by focusing on procurement, logistics, and distribution and using IT to track and identify demand on a product-by-product basis, to increase transparency and to lower supply chain costs.9 These increased efficiencies allow Walmart to lower prices, leading to increased volume and scale, which in turn enable Walmart to invest further in technology and process improvement. This virtuous cycle, which Walmart calls “The Productivity Loop” is shown in Figure 1. Value chain coordinators create value by coordinating the front- and back-end of the value chain. A value chain coordinator may orchestrate major activities along the entire value chain or be focused on a narrow slice of the chain. In the electronic commerce domain, value chain coordinators are often platform businesses which facilitate transactions or interactions among the users of their platforms. They relegate direct value creation to other participants in the value chain, while the platform itself coordinates activities, streamlines business processes, and reduces search and transaction costs. eBay is a classic online platform that enables buyers and sellers to find and trade with each other. While the platform users themselves shoulder the burden of direct value creation (eBay does not hold or sell product inventories—only the sellers do), the company is focused on matching buyers and sellers and facilitating transactions among them. Value chain coordinators such as eBay continuously improve and refine their platforms to enhance the performance of the value chain. They often engage in acquiring new customers and seeding new activities to create additional sources of value for their customers. The eBay.com marketplace is a platform business which is focused on the use of Information Technology to support and facilitate trading communities. All other activities are provided by others—merchandising and product inventories by the sellers; shipping by eBay’s logistics partners (such as national postal services or UPS); financing, insurance, and vehicle inspections in eBay’s automotive marketplace are provided by partners, etc. As a result, eBay can focus on the development of its technology platform and on creating a vibrant trading community and developing vertical marketplaces such as eBay Motors, its collectibles marketplace, and its event ticket marketplace StubHub. 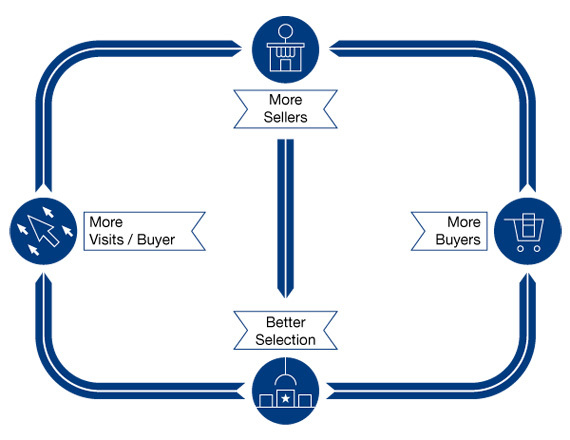 eBay’s “virtuous cycle” (Figure 2) illustrates the logic of value chain coordi-nators which are characterized by two-sided network effects, in this case between buyers and sellers. First, buyers attract sellers to the platform. With more sellers, buyers are more likely to find any product they are looking for at a desirable price, which increases the number of buyers and the frequency of their visits to eBay. This, in turn, makes the platform more attractive to sellers, who are looking for buyers, so more buyers join the platform, and the cycle continues. The empathy stage is followed by a definition stage that unpacks and synthesizes our empathy findings into compelling needs and insights which allow us to come up with an actionable problem statement.13 This is followed by an ideation stage that generates multiple potential solution ideas. The goal of the ideation stage is to explore a wide (i.e., encompassing a broad range of diverse ideas) and deep (i.e., exploring a large number of ideas) solution space. The ideas are then sorted out using the business model construct discussed above: each idea is analyzed in terms of the value it may potentially create for customers, what it takes to deliver that value, and the resulting profitability and growth potential. This means that the analy-sis starts at the front end (focusing on value creation potential) but is then filtered using a back-end perspective (focusing on feasibility, cost, and profitability). The initial business model resulting from this process is incomplete; it is in effect a business model prototype with a given logic. To prove or disprove this logic, we need to test its central assumptions or premises. We thus identify the key premises and proceed to test them. The results of each test are used to revise the business model, modify its logic, identify the new central premises, test them in turn and continue to iterate. This iterative process ultimately results either in a business model which is believed to be viable, or in abandoning the specific innovation on the grounds that based on the tests to date, it is unlikely to lead to a viable business model. The latter outcome is often manifested in the form of running out of funding. At the front end, the focus of the process is on customer needs and value creation. At the back end, the focus is on putting together a solution that efficiently fulfills that customer need, costing it out, and trying to make a profit. In both cases, the business model development process calls for extensive human judgment, combining experience and creativity. As a result, it takes months, quarters or years to develop a proven, viable business model. What we have seen to date is, however, only a modest beginning. Developments in IT are likely to fundamentally change the nature of the firm and with it the essence of innovation. I address three of these developments below: the convergence of virtual and physical identities, the convergence of models and reality, and the convergence of atoms and bits. All three developments are highly interrelated. IT can be used to create a virtual reflection of physical-world activities. For example, a consumer’s credit card account is a partial digital representation of his or her financial life. It includes (among other things) profile information such as the consumer’s name, address, and social security number; credit data; and transactional data. In essence, the real-life consumer is shadowed by a virtual identity that tracks some of his or her financial activities. Historically, the information embedded in this virtual identity was quite incomplete, as most payments were made in cash, credit card transactions were consummated with a delay of weeks, and it was hard to relate them to one another. Today, a large and increasing percentage of payments are made electronically, they are recorded and made available in real time, and it is faster, easier and less expensive to process them to obtain a more complete picture of the consumer’s finances. As a result, the consumer’s virtual identity provides a more accurate representation of his or her real financial life. More generally, virtual identities are converging to real identities as a result of the increased use of mobile devices and sensors as well as the use of cloud computing. Mobile devices and sensors accompany people anywhere and they touch many different aspects of everyday activities. They generate a rich digital footprint that enables the replication of an increasing number of consumer activities ranging from physical movements to transactions and communications. Cloud computing in turn enables real-time recording of the data as well as its retrieval and processing on demand. Virtual identities are thus converging towards physical identities to the point where the former can serve as effective surrogates for the latter. A related trend applies to the ability to create integrated, high-fidelity models of behavior based on multiple, synchronized data sources. For example, a customer’s behavioral data may be combined with social network data to infer, based on both the customer’s own past transactions and behaviors as well as those of her friends, which product configuration will likely be most attractive to her. “Quantified self” models in the fitness and healthcare field combine data from wearable sensors, electronic health records, and other sources to improve wellness and performance. Companies such as Netflix use customer ratings and past viewing habits in conjunction with other customers’ information and market-wide trends to recommend movies and TV series a customer may be interested in viewing. By integrating data from multiple sources and developing models that can estimate prospective customers’ preferences and predict their future behaviors with increasing precision, such “Big Data”19 approaches are able to test how a customer might react to a prospective offer without actually making that offer. While the results of such estimates are always subject to error, these errors may be diversified away once such offers are made to a large number of prospective customers. And, customers’ responses to the models’ estimates provide further information that may be used to further calibrate and refine the models. People spend an increasing percentage of their time in the virtual world, where customized information products and services can be produced through the use of software. Software can make “bit” products fully responsive to customer demands, albeit at a cost. As for “atoms,” manufacturing is increasingly driven by software which makes it possible for physical products as well to be more responsive to customer demands. Robots can be programmed to support flexible and still low-cost manufacturing processes which are increasingly replacing the assembly lines of the twentieth century. Mass customization and postponement allow companies to combine the cost advantage of scale with the benefits of customization to create customer-responsive products. And, a host of new technologies enable the creation of a unique yet affordable product for each customer, ranging from custom-made T-shirts and shoes to one-of-a-kind industrial components. As a result, back-end processes are becoming increasingly responsive to front-end demands. Additive manufacturing (also known as “3D printing”) is an emerging tech-nology that amplifies this trend. Product design is inherently an information (“bit”) activity, but converting the design into an affordable physical product (“atoms”) requires costly tooling and machinery which in turn lead to the cost structure that characterizes mass production, based on economies of scale. With 3D printing, a digital design can be converted into a physical product one unit at a time, increasing the variable unit cost but dramatically reducing the fixed cost that characterizes traditional, scale-based production. Today, 3D printing is used largely to create product prototypes, accelerating the product development process that leads to mass-produced products. However, 3D printing is increasingly being used to create custom gifts, apparel, and industrial components, not to speak of tattoos, body parts, and food. Today, expensive 3D printers are largely used to create plastics products in a matter of hours. In the future, the variety of materials that benefit from 3D printing will expand, and the cost and time per unit will shrink. As a result, low-cost manufacturing of fully customized products will likely become a norm rather than the exception. This does not mean that mass manufacturing will become extinct—rather, it will be augmented by a variety of affordable customization options. The foregoing discussion suggests that IT will not only accelerate the process of business model development—rather, it will lead over time to a substantial qualitative change. A market comprising customer intimacy agents, suppliers/producers, and value chain coordinators will be able to provide better solutions than today’s firms. The customer intimacy agents will specialize in identifying customers’ current and future preferences and in helping customers to choose among alternative solutions. Producers and suppliers will specialize in developing and selling physical or digital products. Value chain coordinators will match supply and demand, configuring solutions that use existing physical or digital products (or components), as well as mediate the creation of new products based on the information they receive on customer preferences and supplier capabilities. Emerging seeds of this structure already exist today. Multiple marketplaces are matching supply and demand for products (eBay), business supplies (Ariba), people’s time (TaskRabbit), space (Airbnb) and transportation options (Uber), to name just a few. Some of them offer value added services and customized solutions. In most cases, however, customers have to explicitly state their preferences in crude form and they then have to spend time and effort and exercise judgment to make the final selection. And, new product development is within the domain of producers. To explain the transformation I anticipate in concrete terms, consider for example the travel market. Today, consumers may express their preferences involving price and schedule among competing airline flights to a travel search engine, which then looks at supplier data and configures a travel solution for them. In most cases, the preferences are expressed in rudimentary form (e.g., price or schedule, with no tradeoffs between the two), the solution is not comprehensive (e.g., airlines are selected separately from hotels, although some travel providers offer a rudimentary form of bundling, based primarily on available discounts rather than on consumer preferences), and the consumer has to make the final choice because the search engine does not truly understand his or her preferences. A customer intimacy agent that tracks the consumer’s travel preferences and represents him or her in the choice process. Conceptually, the agent may support other consumer activities beyond travel, but I believe domain expertise will continue to be important, and as a result we are likely to have domain-specific agents, at least early on. Looking at the consumer’s schedule, future plans, and past experiences, the agent will continuously seek proactive travel solutions to be offered to her. In some cases, the agent will not be able to anticipate the consumer’s travel needs; in that event, the consumer will trigger a solution search which will be managed by the agent on her behalf. It is easy to imagine conceptually how the consumer might delegate her travel choices to an agent who has comprehensive data on her entire travel experience, schedule, opportunity cost of time, etc., vast information on consumers like her, and the ability to analyze the alternatives and select the best solution. The key dimensions of competition among customer agents might then be based on their analytic capabilities and on their ability to consistently find best solutions for a given customer segment. The revenue model of the customer intimacy agent will likely be subscription-based, with a component based on performance. Travel suppliers, who offer pre-configured travel components (similar to today’s flight schedules and airfares, as well as available hotel rooms and their prices) as well as spare capacity which is available for future configuration. A value chain coordinator, who mediates the customer intimacy agents vis-à-vis the travel suppliers. The value chain coordinator plays the role of both a marketplace and an entrepreneur. As a marketplace, the value chain coordinator will configure customized solutions when prompted to do so by the consumer’s agent. It will seek the different flight segments, hotel rooms, airport transportation, etc. among the available preconfigured travel components and will offer them to the customer’s agent as fully configured solutions. The division of labor between the customer intimacy agent and the value chain coordinator will depend on the level of trust they have developed over time, as well as on the degree to which the customer’s agent wishes to protect the customer’s data. As an entrepreneur, the value chain coordinator will suggest new products the supplier might want to offer (beyond its available pre-configured travel components) by matching information collected from the customer intimacy agents (i.e., their customers’ preferences and needs) and the suppliers (i.e, available capacities for different travel components). The new product may be customized or “mass produced.” For example, the value chain coordinator could suggest that a hotel might customize an available suite for a honeymoon, or it may use aggregate data from multiple customer intimacy agents to suggest a new flight route using the supplier’s available capacity. Thus, a customer’s agent may tell the value chain coordinator it expects its client to travel to a conference in New York between April 12 and 16, possibly staying over for the weekend depending on price, and seeking a flight and a hotel room for the corresponding days. The value chain coordinator may then suggest an appropriate travel solution based on the available travel components. However, given the fine-grained information about both demand and supply which is available to the value chain coordinator, it may infer that enough people who value their time highly are taking the same route to justify the creation of a new nonstop flight. Further, the value chain coordinator will know which airline has the capacity to offer that flight and make it profitable. The value chain coordinator may then suggest that the airline offer the flight, and it will also suggest a price based on the opportunity cost of the marginal consumer. In this example, the value chain coordinator is doing more than matching demand and supply: it is commissioning the development of a new product based on the information it collected from customer agents and travel suppliers. Similarly, in the case of industrial products, customer intimacy agents represent potential buyers’ preferences, suppliers offer products and capacities that, put together, create potential solutions, and value chain coordinators may match buyers and sellers, create value-added solutions by adding solution providers to the mix, suggest the creation of unique custom products, or commission the development of new products that may be sold to multiple buyers. This structure automates key parts of the customer-driven innovation process. For preferences and needs that have already been captured by the customer intimacy agents, empathy can be performed in software.Importantly, this will not eliminate the traditional form of empathy; rather, it will raise it to a higher level. Customer intimacy agents will engage in a more traditional form of empathy to innovate their own business models —for example, to augment the data they already capture electronically and to suggest what new forms of data might be valuable to capture. Value chain coordinators will engage in an electronic form of ideation, based on electronic enumeration of potential product concepts. They will test each candidate product configuration in software, aggregating demand and preference data from the customer intimacy agents and capacity, supply and cost data from suppliers. By comparing value and cost, they will be able to determine which of the candidate products are viable, although the ultimate tests of the resulting products will take place in the marketplace. A simple analogy to this form of automated innovation is provided by the use of combinatorial chemistry in the pharmaceutical industry. Drug development is a long and protracted process which can take ten to twenty years using traditional techniques. With combinatorial chemistry, molecular constructions are automatically synthesized and tested for biological activity. The technique takes a few molecular building blocks and uses an automated process to create numerous combinations by mixing and matching these building blocks. Thus, rather than engage in a manual, time-consuming screening process, machines create thousands of drug leads each day by mixing the chemicals under pre-specified test conditions. This “high throughput screening” process enables parallel testing of drug leads which dramatically accelerates the drug development process. And, once the results of these screening analyses are determined, they are stored in digital libraries, replacing in vitro laboratory tests (i.e., “test tube” tests) by in silico (i.e., computer-aided) tests, using computer programs to quickly sift through digital combinatorial libraries. Engaging in traditional customer-driven innovation for new products and service ideas that were not inferred electronically. The latter form of innovation will continue to be important. While electronic customer-driven innovation can work well for products that are natural extensions of existing products, there will always be breakthrough products whose success cannot be inferred from the available data. In fact, the ability to engage in more traditional customer-driven innovation may be a strong differentiator for the most successful product developers. Customer-intimacy agents will be customers’ digital representatives in the marketplace, using data to find and solicit solutions that will make them better off. Value chain coordinators will match supply and demand, assemble customized solutions, and engage in electronic customer-data-driven innovation. Producers will increasingly engage in marketplace selling and data-driven innovations. Traditional forms of innovation, however, will continue to be important and will become key differentiators. First, the underlying business models will require continuous innovation which will likely take a traditional form. Second, breakthrough products will probably continue to require traditional forms of innovation. See, e.g., A. Osterwalder and Y. Pigneur, Business Model Generation: A Handbook for Visionaries, Game Changers, and Challengers (Hoboken: Wiley, 2010). For a comparison of common definitions of the business model construct, see C. Zott, R. Amit and L. Massa, “The Business Model: Theoretical Roots, Recent Developments, and Future Research,” IESE Working Paper, September 2010. USAA was the first to employ this method to support military personnel who did not have access to a physical branch. It has since been adopted by mainstream banks to facilitate the check deposit process. The payments made to PayPal, which is a separate business, are not included in this analysis. See M. Treacy and F. Wiersema, The Discipline of Market Leaders: Choose Your Customers, Narrow Your Focus, Dominate Your Market (London: HarperCollins, 1995); H. Mendelson, Value Disciplines: A Quick Overview, Graduate School of Business, Stanford University, 2011. Marriott International purchased a 49% stake in Ritz-Carlton in 1995 and increased it to 99% in 1998. Walmart’s attempts to extend its appeal by deviating from this logic over the mid-2000s have been largely unsuccessful. This is described in more detail in the case study Walmart by H. Mendelson, Graduate School of Business, Stanford University. See H. Mendelson, Walmart, op. cit. See Eric Ries, The Lean Startup: How Today’s Entrepreneurs Use Continuous Innovation to Create Radically Successful Businesses (New York: Crown Business, 2011). See Steve G. Blank, The Four Steps to the Epiphany: Successful Strategies for Products that Win (Menlo Park, CA: K&S Ranch Press, 2005). d.school bootcamp bootleg, Stanford University, 2013. Zott, Amit and Massa, op. cit. S.M. Shafer, H.J. Smith, and J. Linder, “The Power of Business Models,” Business Horizons, 48 (2005), 199-207. “Next Stop—The 21st Century,” Fast Company, August 31, 1999. This trend has been recognized years ago. See H. Mendelson and J. Ziegler, Survival of the Smartest: Managing Information for Rapid Action and World-Class Performance (New York, Wiley, 1999). For an overview of “Big Data,” see “Big Data: The Next Frontier for Innovation, Competition, and Productivity,” McKinsey Global Institute, May 2011. Similarly, as discussed below, producers will engage in both electronic and traditional forms of innovation. Mendelson, Haim. "Business Models, Information Technology, and the Company of the Future." In Reinventing the Company in the Digital Age. Madrid: BBVA, 2014.